About H & M Leasing Corp.
H & M Leasing Corp. possesses all necessary permits, licenses, approvals and authorizations (“Licenses”) from Federal, State and local governments to perform services which include collection, transport, handling, recycling, and, where applicable, charitable donation of the material collected at households. All our collection vehicles are current, well maintained and are properly registered, inspected, and all vehicle operators have valid licenses and proper insurance. H & M Leasing Corp. is a registered fund raiser with the Charities Bureau in the State of New York. 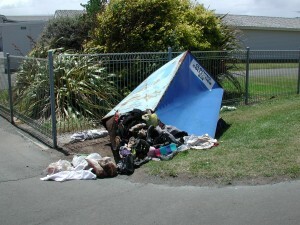 Collection bins have long been an established method of aiding in the harvesting/collection of clothing/shoes donations. Dealing with an experienced and reputable organization such as H & M Leasing Corp. will help alleviate the current issues surrounding the presence of illegal & unsightly clothing bins in your community and neighborhoods.